Cosford is probably the most popular of the Filberts, which allegedly have a superior flavour to regular Hazel nuts.produces attractive nuts with a good hazel flavour. 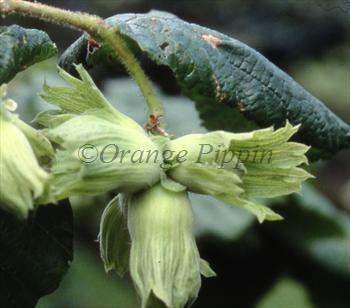 Cosford is a good pollinator for many other Hazels and is therefore a good choice if you are starting your own nut orchard. Please fill in the details below and we will let you know when Cosford hazel trees are back in stock. Cosford is self-sterile and needs to be pollinated by another tree of a different variety nearby. Cosford is easy to grow and requires little attention. It needs a pollination partner - in a suburban or rural environment there may be other hazel trees nearby - any wild hazel tree or bush within about 50m should be suitable. If in doubt then Gunslebert is a good choice, and this will encourage better cropping, which can be a bit light. Cosford is a good pollinator for other hazel nut varieties, because it produces lots of catkins and pollen over a long period.